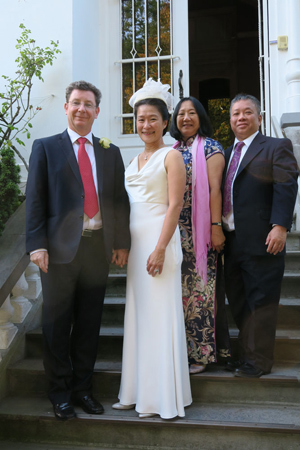 David Ing and Diana Yee attended the wedding of Pierre Osterrieth ’82 and Bee Yap in Belgium in September. Osterrieth had attended David’s wedding 30 years earlier, and at the reception, Osterrieth’s family expressed giving up hope that he would ever get married! Some of Yap’s friends and family attended, with a reception planned in Malaysia in December. Osterrieth was somewhat uncomfortable with being the center of attention (some may recall he preferred being backstage for the Special-K Revue). Gina Tapper is a strategic partner with the healthcare advisory group of The BDO Center for Healthcare Excellence and Innovation. Tapper recently moved to wonderful Coronado, California, where she restored a historic cottage. She regularly sees Kellogg classmates Diana Ingram. Patty Bloomfield, Don Grasso, Joan Shapiro (Gately), Joel Shalowitz, Debbie Yanofsky and Sharon Maluth (Weiss) (all ’82). Mark DaSilva is director of marketing, product management and supply chain at North American Pipe Corporation, a division of Westlake Chemical in Houston, Texas. Lesley Hatch started a new job in 2015 as vice president and COO of Good Shepherd Housing and Family Services in Alexandria, Virginia.